How can we prepare the next generations for the world and the climate they are to inherit? Rob Gell ponders the many lessons from this Summer’s extreme weather events. THIS AUSTRALIAN SUMMER gives us a number of things to think about. The difficult thing is to work out how all these things are linked together. Last year, 2013, was Australia’s hottest year ever and we’ve started 2014 with another 50°C heatwave over inland Australia that then migrated to the southeastern states. Exaggeration is the name of the game, I don’t recall a single 50C but it was just as hot or hotter between 50 and 150 years ago. Rob Gell suffers from a lack of historical knowledge, yet some of his geography makes sense. Just like this months European floods, snow and other natural disasters, skeptics predicted this a long time ago, yet the Met Office failed miserably. While Victorians flocked St Kilda beach, Americans battled snow storms. At the same time the United States of America experienced an historic cold outbreak with life-threatening wind chills. Some people called it a polar vortex, as cold air from the northern polar region was funnelled southward over the United States as far south as the Gulf Coast. More than 200 million people were affected by the extremely cold air. On one day, all 50 United States experienced temperatures below freezing.By the end of January, the United Kingdom was experiencing flooding and coastal storm surges driven by gale force winds. On 3 February there were almost 300 Environment Agency flood alerts or warnings in place across England and Wales. As well as thousands of hectares of flooded countryside and hundreds of homes. Storm waves have caused sea cliffs to collapse, coastal sea walls have been battered and lives have been lost.This is all in the territory of geography and being a geographer enables a real understanding of these seemingly unrelated events. An understanding of geography means that you will be able to understand why these things are happening; what the impacts are and what we can do about them. There is a lot geography can teach future generations about their world. And, the new Australian Curriculum has formally introduced geography to the primary curriculum for the first time, opening up further opportunities to share these newsworthy global events with students in the classroom. In the case of these weather related events, we need to remember that all of the atmosphere is connected. In particular, in January the upper atmosphere jetstream that produced the polar vortex in the United States also produced the storms in the United Kingdom as it crossed the Atlantic Ocean. There’s a seesaw effect called the North Atlantic Oscillation. The question for scientists is whether we are more likely to see more or less of the past few months’ storms and extreme weather events. As the atmosphere warms because of the enhanced greenhouse effect there is more heat energy being trapped in the Earth’s atmosphere. With more energy in the system, we can understand that storms will become more intense, producing more rain and stronger winds. The problem with all this extreme weather is that it has consequences. Adaptation to higher temperatures has become a serious challenge for Australia. More people died in the extreme heat of the week before Black Saturday 2009 than died in the fires. 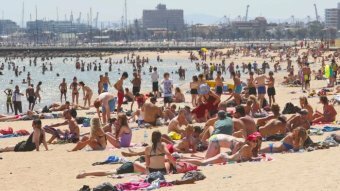 The recent heatwave in Australia has claimed many more people than the normal number of deaths each week — mostly elderly people and the very young. Australia’s record hot year is part of a global, longer-term trend. Over the past century, the Earth’s climate has warmed and continues to warm. More record hot weather is occurring around the planet. … The hottest day Adelaide has ever experienced was in January, 1858, when the mercury rose to 116.3 deg. Looking back to the UK, the flooding is significant but it seems that the consequences are far greater today than in the past. A major part of the problem is due to land management and an agricultural subsidy for farmers who are encouraged to remove “unwanted vegetation” from their land. This subsidy has had the effect of clearing vegetation from the hillsides where rain falls. Without the trees, the water runs off the land quickly into the streams rather than being absorbed into the land. This policy encourages farmers to engage in low-value farming on poor-quality land in order to receive the financial subsidy. The cost that the entire community bears is flooding in the downstream sectors at times of high rainfall which causes evacuation of settlements, wrecking of houses and unfortunate loss of life. By all accounts high rainfall events are also becoming more frequent too. Rob, weren’t you listening to Tim Flannery, the permanent drought was to be our new climate! As for flooding, the US has 85,000 dams, but greenies don’t want to build more here to use all that wet gold. These issues are the same in Australia. In our last big floods in eastern Australia in the summer of 2010/11 record rainfall falling in catchments that were previously planted with trees and shrubs fell on the same catchments now cleared for agriculture or paved with roads. Neither the river channels not the reservoirs built on the streams can hold the volume of water that falls. New settlements built on floodplains are in the direct path of the water that runs off rapidly causing violent floods. That’s called history repeating itself Rob, look it up. Otherwise you are condemned to repeating it. Trove is a good site to look at. A geographical understanding of inter-relationships between catchment hydrology, channelisation of streams and the erection of levee banks, vegetation and revegetation, weather and climate, planning for settlements and environmental health will be fundamental to our ability to adapt to future changes in the natural world around us. Bringing geography into the classrooms of our youngest citizens is a small but important step to building understanding across the community about the link between weather events, land management and scientific evidence. These children are inheriting an unpredictable world, and the least we can do is prepare them for it. At last, ‘geography’. I hope your not teaching my grandkids Rob. At least they are not mi8n Victoria! I could give you a lot more, but I am not your teacher, do some homework instead. Rob Gell AM is a consultant, coastal geomorphologist, Fellow of the Royal Geographical Society, Patron of the Geography Teachers Association of Victoria and former television weather presenter. This article was originally published on Splash, the ABC’s education portal. This entry was posted in Climate, comedy, Environment, science, weather and tagged ABC, climate change., comedy, environment, geography, history, Joanne Nova, rob gell, science, weather. Bookmark the permalink. Is there a measurable and countable definition of “extreme weather”? To me it sounds like a political thing not a scientific one so what does it mean? Climate science is a synonym of political science, it’s all about money!